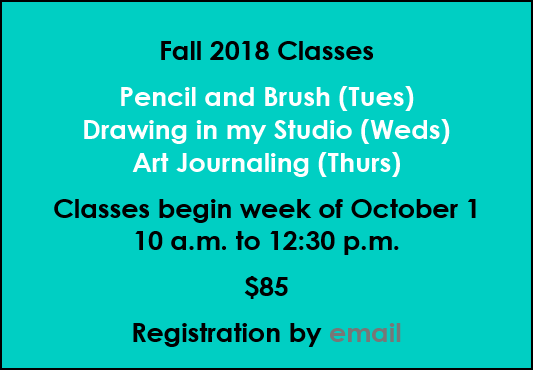 I have four new openings for classes in the Fall Session, starting next week. 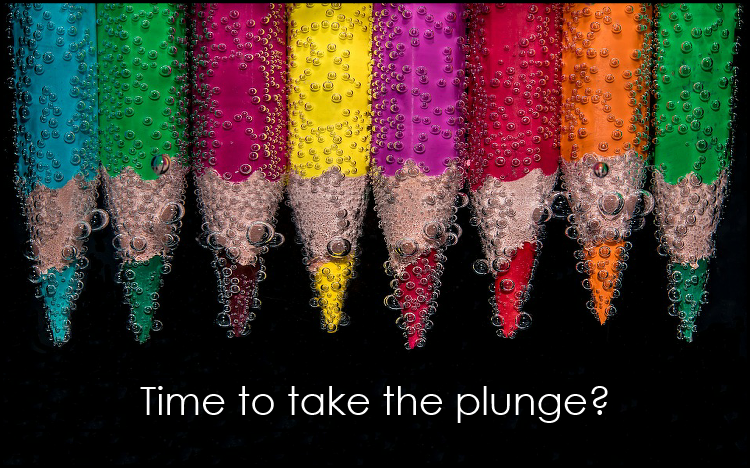 Why not take the plunge and try them? What if your voting rights were taken away through sleight of hand methods, you could no longer hold political office, your promise of land ownership disappeared, you were oppressed though “separate but equal” and your life was endangered through beatings and/or lynchings. Welcome to the post Reconstruction period in US history. Now after awhile, as a freedman, you could find work and more opportunity but it was hundreds of miles away. Would you make the trip? 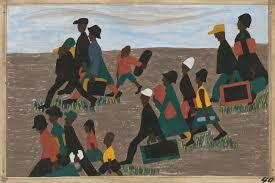 Many blacks did just that and it was called the Great Migration. 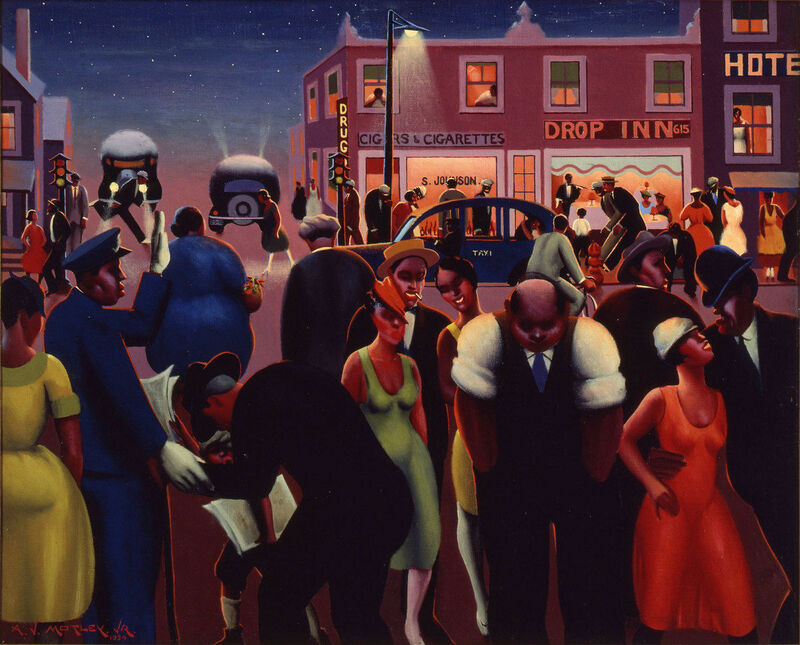 It's estimated that six million African Americans headed north or to the mid-west for a better life, which eventually sparked the Harlem Renaissance. It’s too bad we did’t learn much about what happened after the Civil War and the Reconstruction in school. I knew it happened but it was brushed over with some dates and a story or two of carpetbaggers. So to fill in the gap and get the backstory here, let’s return to those days. 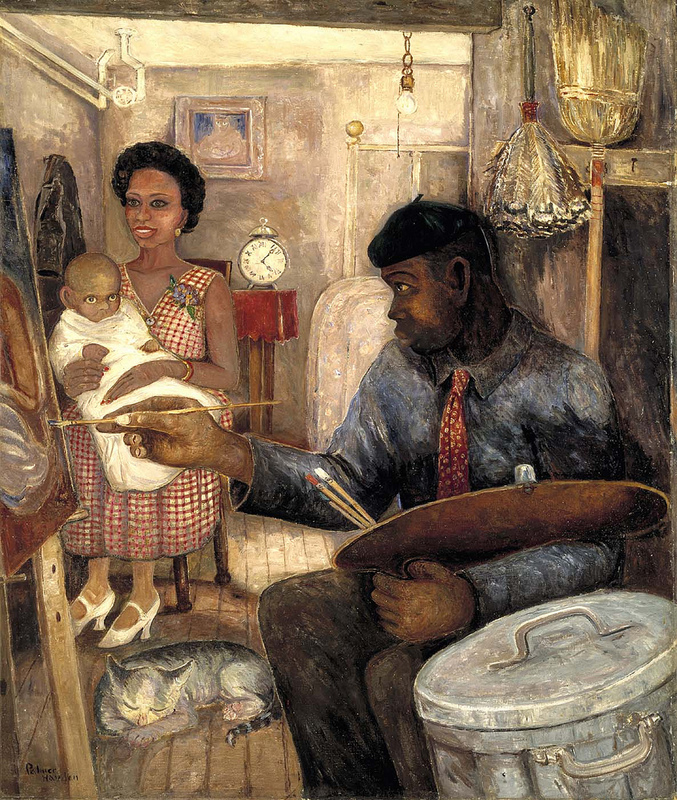 Perhaps it will give us a deeper understanding and appreciation for the arts' explosion in Harlem after WWI to mid-1930s, ending during the Depression. After the emancipation of the slaves, three amendments were added to our Constitution, 13th, 14th and 15th . They covered the elimination of slavery, guarantee of citizenship, and the right to vote for African-American men in that order. To ensure peace and protection, the south was carved up into five military districts. Freedmen Bureaus were established to help freed slaves with temporary housing and provisions. Ideally that should have worked, but there were all sorts of things going on that hurt these freed people (which is entirely another story). In 1876, the Presidential election was highly controversial (it’s not only a modern-day phenomena). The Democrat Samual Tilden won 184 electoral votes, while Republican Rutherford Hayes won 165. Twenty votes were unresolved. A compromise was formed with the Republicans taking the White House and the military leaving the South, leading the way for Redeemer Democrats who immediately went into action to suppress voting rights. By 1905, black men were not elected to state legislatures in the South, compared to over 2,000 in public office after the Civil War, including a US Senator and House Representative. Things got worse with the push for White Supremacy, KKK, paramilitary groups and Jim Crow laws—no wonder people had to leave. In 1900 African-Americans made up 90% of the Southern population. 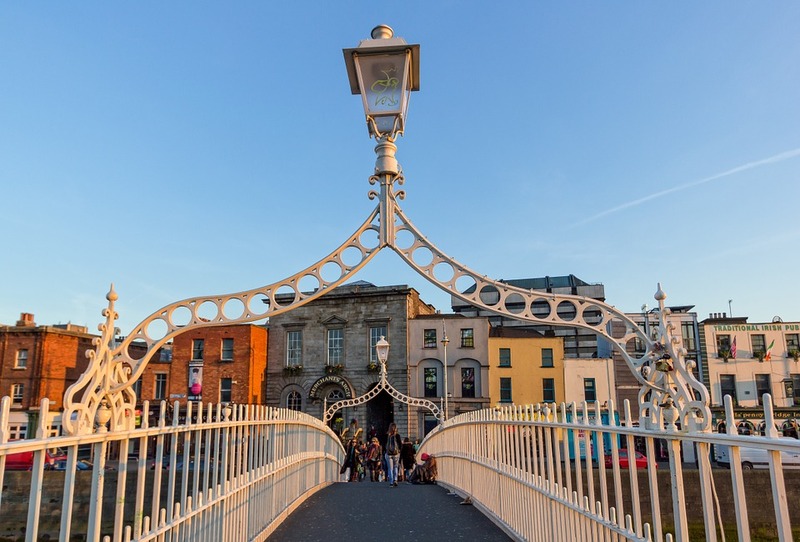 Within a decade, 204,000 moved North to find better living conditions. And many of these migrants landed in Harlem, which eventually became a mecca for intellectual, social and artistic expression until around 1935. In my readings I found a very interesting story about a guy who had just arrived in Harlem and noticed black men wearing uniforms—cops. It was amazing. What astounded him more though was when he saw a black (or colored cop)directing traffic in the middle of street with white drivers unbelievably stopping when he lifted his hand. He just couldn’t believe that white people would follow orders from a black man. Says a lot to me. 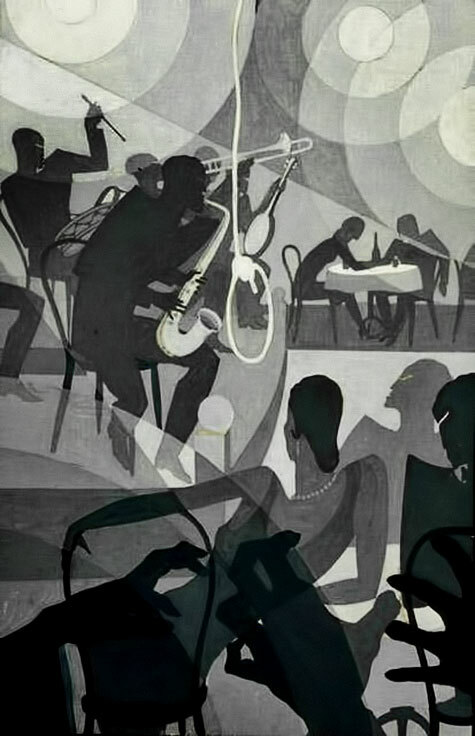 This was the time of the Cotton Club, the Savoy, writers like W. E. B. Du Bois, Langston Hughes, Zora Neale Hurston; musicians like Louie Armstrong, Dizzy Galespie and so on. 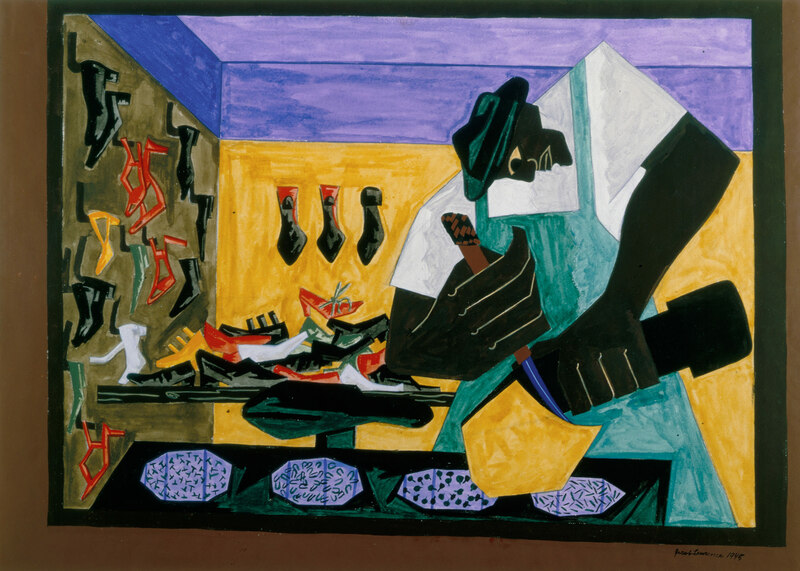 Interestingly, the visual arts aren’t discussed much as many of the black artists went to Paris (I don’t blame them at all!). But there were several who either were in Harlem or were influenced by the movement and lived in other cities. Here are a few. BTW, knowing some background may help to interpret their works. All I can saw is that they are all wonderful. 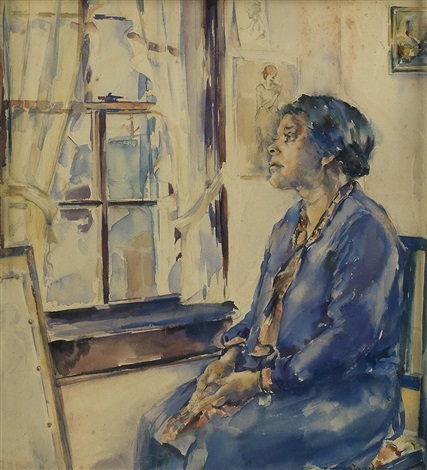 Vivian Schuyler Key 1905-1973 Portrait of Mother Jessie, 1927 Watercolor on cream board. 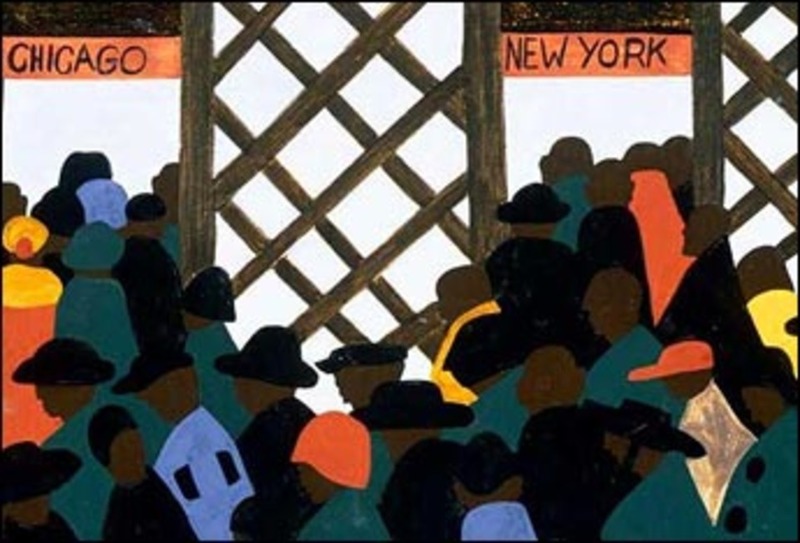 In 1941, a young, twenty- three-year-old Jacob Lawrence decided to tell the Great Migration story through 60 small tempera paintings. 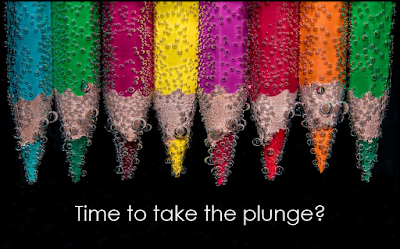 It’s an amazing feat, one which I will share here, but you can find more at this site.. 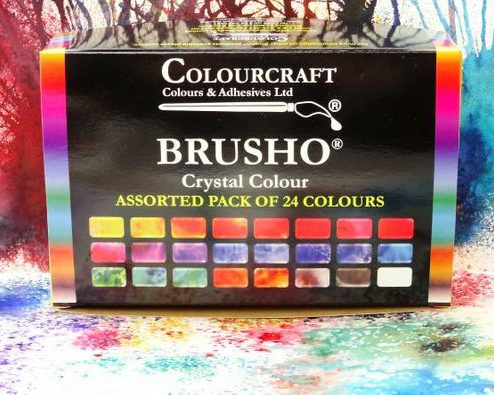 Please note, I have cancelled the November, Beginning Acrylics, workshop and replaced it with Mixing Acrylic Colors using the CMY model. Only payment reserves your seat. In my watercolor and acrylic painting classes and workshops I teach with only three colors--cyan, magenta, yellow--plus black and white, also known as CMY primaries from which you can create all other colors. In my opinion, the best wheel to purchase is from The Color Wheel Company™, a local firm out of Philomath, OR. I know you probably have one of these tucked into a drawer somewhere. If you're like me, I buy supplies thinking someday I will need them, and then I totally forget to use them or more commonly these days, forget where they are. In the examples below I will be using these wheels, which will make it convenient for you if you already have one or you are looking to purchase one. So let's now look at two specific wheels: the traditional and the CMY wheels. 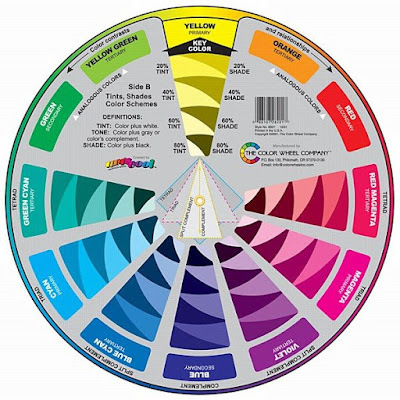 The traditional color wheel has been the customary one taught in grammar school: the primary colors are red, yellow and blue. Below is a shot of the front part of the traditional wheel. As you can see, yellow heads the wheel. That's a good method as it is the lightest color. Now draw your attention to the red on the left side and the blue on the right side. They are your primaries. Notice just below the yellow is a blue tab and further down, you'll see green. That's because by moving the upper wheel to a particular color, you can see what happens when you mix the two. Thus yellow and blue make green. When you place red under orange, you will get a reddish orange. 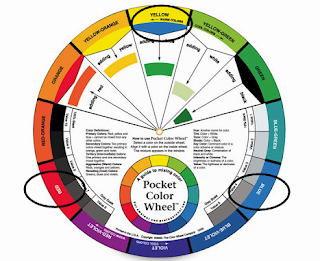 Also this wheel is great for mixing complementary colors (those that are opposite each other on the color wheel), which are usually earth and grayish colors. Here's an example. I placed the yellow tab up against the violet, both of which are complementary colors. Notice what color appears: brown. But there's more to this wheel than just mixing colors. It also offers definitions of colors from what are the primary colors to values, including a value scale. Flip the wheel and you'll find another panel that moves around the colors. But this side shows color relationships and more definitions. 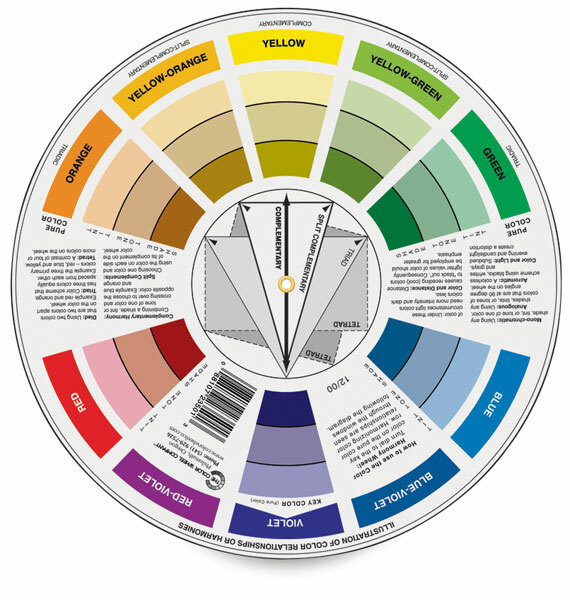 Starting with yellow, that's the pure color, you will see three other colors below it: tint (color, plus white), tone (color, plus gray)and shade (color, plus black). By the way, please note that yellow and black make a wonderful olive green. You also can find more definitions and in the center a good visual example of the complementary, split complementary colors and triads. I don't remember when it happened, but I eventually discovered the CMY model. It uses the same colors that reside in your color printer--flip the top and you'll see those four colors: cyan, magenta, blue and black (white is the color of the paper, just like in watercolor). Furthermore these are the same colors that commercial printers use. Look at any magazine or colored brochure and you're looking at a combination of just these colors. 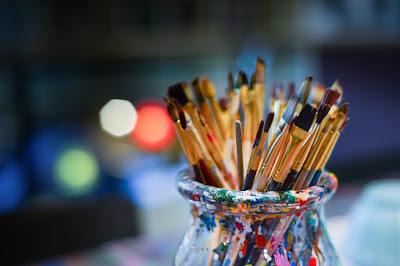 When painting in oils and acrylics, you use white for blending and representing the white in say clouds, waterfalls, etc. Now I have to admit that this three color, plus black and white method needs practice. I didn't learn it overnight. Just like anything else it takes time, thought and work. But there's one thing to consider, instead of buying 20 colors (hmm, well I have a whole drawer full), you only have to buy five and they make as many colors as you want. What's more, once you get used to the system you'll never want to go back. I've had several students who have resisted using this model. In fact, I had one student sneak in her own favorite brown instead of mixing green and red to make hundreds of muddy, deliciously gorgeous earth colors. 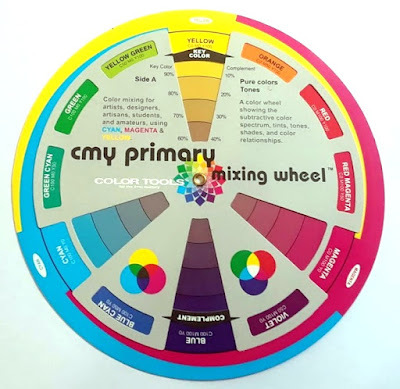 So how does the CMY wheel look as opposed to the traditional one? There are some surprises. Let's see. Side A The front of the CMY primary wheel shows the key color. Going back to yellow again, the arrow is pointing to the color combination. In this case, it is C0 M0 Y100, which means you use 100% yellow to create this color. Different colors appear under yellow. These represent what happens when you combine your complement color (blue) with yellow. The first tier is 90% yellow to 10% blue, 80% and 20% on the next tier. Now I hear you saying, wait a minute, yellow and blue make green. Not necessarily on this wheel. As I've discussed in other postings, the letters and number appear on your painting tube. They tell what formula was used to make this paint. Please notice that the secondary colors are not necessarily green, orange and purple, but green, red and blue. WHAT! you say. How does this happen? Let's take red. 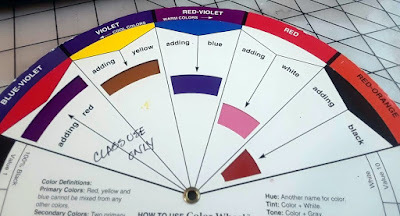 When you move the color wheel (side A) to red, you will find the following mixture: C0 M100, Y100. For me, that would be too orange-like. I usually place a smaller amount of yellow into the magenta and can get a wonderful fire-engine red. The same type of formula is stated for blue: C100 M100 Y0. By equally mixing the cyan and magenta, I don't necessarily get the same blue, so I fiddle around until I do get what I want. Although it sounds frustrating, it's not. In fact once you get your hands on these three colors, plus black and white, you'll have lots of fun! Okay, maybe I have left you completely confused. I hope not. 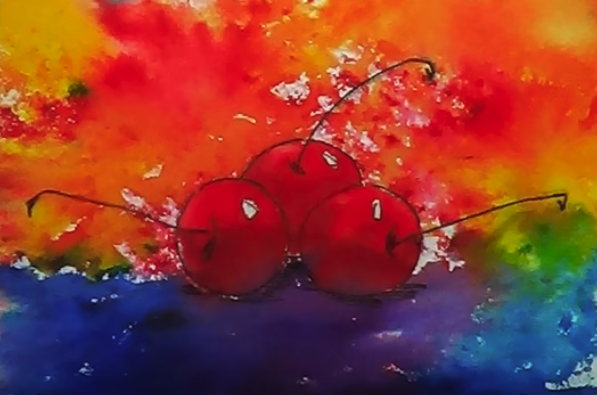 But if you want to learn more, here is a great video from Art School Graphics: https://youtu.be/0aHdRII3L5g It's only part one, but it will give you a better idea of the process. But never fear, I will be offering a video of my own regarding color mixing with the CMY wheel in the next issue. Until then, here's what's coming up in my studio this fall. Here's the plan so far. We will visit Dublin, Galloway, Belfast (Titanic Museum) and Cork (Blarney Castle) the first week of September 1-8, 2019. Details will come soon. 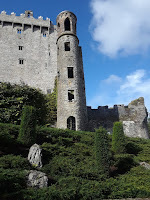 We'll enjoy lots of time sketching loads of street scenes, old castles, pubs, and terrific landscapes! If you're interested let me know by email. I'll put you on the Ireland mailing list. I should have more definite info by October. Thanks for a great year. 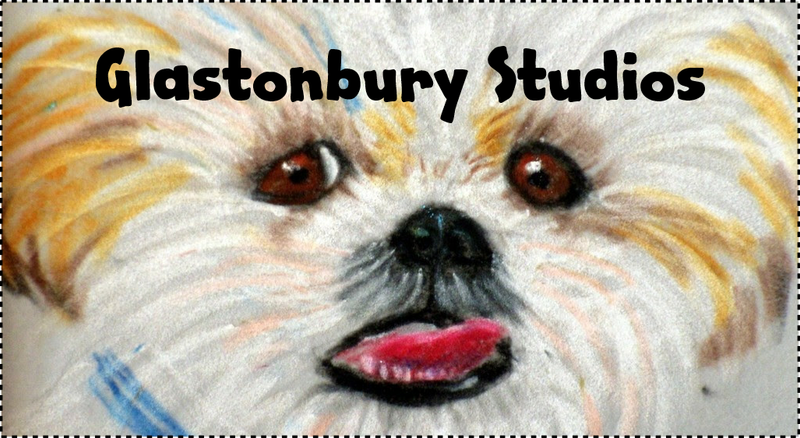 Studio classes have done well and are still continuing until mid-August. We do have one opening in the Drawing in my Studio class on Wednesday. Email me if you interested. As for workshops, I cut down the number of workshops from last year, but will most likely increase more in the next 2018-2019 academic year, which officially starts October 1. 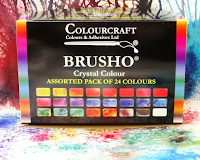 I am offering an interesting workshop on Friday, September 7, entitled, Watercolor with Brusho. This is a fairly new product to the US, but has been used by teachers in England for years. Check our my YouTube channel that offers a short video. Let's plan the next year. See my YouTube video on this product. New fall classes to include three morning classes. Beginning October 1, I will be offering three morning classes: Tuesday through Thursday. I will be discontinuing evening classes for now. Here's the plan so far. 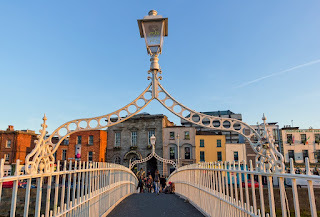 We will visit Dublin, Galloway, Belfast (Titanic Museum) and Cork (Blarney Castle) the first week of September 2-8, 2019. Details will come soon. We'll enjoy lots of time sketching loads of street scenes, old castles, pubs, and terrific landscapes! If you're interested let me know by email. I'll put you on the Ireland mailing list. Next issue, coming in September, will cover a series on the three color, plus black system.